Chilli peppers are indispensable to Malaysian kitchens, and both fresh and dried chilies are used. Chillies come in several sizes, shapes and even colours. As a general rule, two type of chilli cultivars are the most commonly available: the bird's eye chili (cili padi), which although small in size are extremely pungent and very hot; and longer varieties, which tend to be much milder. Green chillies are more peppery in taste, while red chillies, green chillies which have been left to ripen, have a slightly sweeter heat. If a milder flavour is preferred, the seeds and membranes are removed from the chili pods before they are cut, or the chillies are left whole and removed prior to serving. Some common uses include but are not limited to: grinding the chillies into a paste or sambal; chopping fresh chillies as a condiment or garnish; and pickling whole or cut chillies. Belacan is essential to Malaysian cooking. It is a type of shrimp paste which is pressed into a block and sun-dried. In its raw form it has a very pungent smell. Once cooked, the shrimp paste's aroma and flavour mellows and contributes a depth of flavour to the dish. To prepare belacan for use, one typically wraps a small amount in foil, which is then roasted over a flame or placed into a preheated oven. Belacan is most commonly pounded or blended with local chilli peppers, shallots and lime juice to make the most popular and ubiquitous relish in Malaysia, sambal belacan. Belacan is also crumbled into a ground spice paste called rempah, which usually includes garlic, ginger, onions or shallots, and fresh or dried chilli peppers. A rempah paste is similar in form and function to an Indian wet masala paste or Thai curry paste, and is often browned and caramelised (Malay: tumis) to mellow the raw flavours of its component ingredients and produce a harmonised finish. The coconut (Malay: kelapa) is another quintessential feature of Malaysian cuisine, and virtually all parts of the plant are used for culinary purposes. The white fleshy part of the coconut endosperm may be grated, shredded and used as is; dried to make desiccated coconut; or toasted until dark brown and ground to make kerisik. Grated coconut flesh is also squeezed to make coconut milk, which is used extensively in savoury dishes and desserts throughout the country. Coconut oil is used for cooking and cosmetic purposes, and may be either obtained by processing copra (dried coconut flesh) or extracted from fresh coconuts as virgin coconut oil. Coconut water, the clear liquid found inside the cavity of each coconut, is a popular cooler in Malaysia's hot and humid climate. Gula melaka is unrefined palm sugar produced from the sap of the coconut flower. It is the most traditional sweetener in Malaysian cooking and imbues a rich caramel-like flavour with a hint of coconut. Coconut fronds are traditionally used to wrap food, hollowed out coconut husks and shells may be used as a source of charcoal fuel for barbecued meats and traditional pastry making, and even the apical bud or growing tip of the coconut palm is a popular delicacy served in rural communities and specialist restaurants. Soy sauce of different varieties is another important ingredient. Light soy sauce contributes its pleasantly salty flavour to a variety of stir-fries, marinades and steamed dishes. In some hawker establishments, freshly sliced or pickled chillies arrive immersed in light soy sauce to be used for dipping. Dark soy sauce is thicker, more intense in flavour and less salty. It is often used when a heartier flavour is desired, particularly with masak kicap (a style of braising with a blend of soy sauce varieties) dishes, and also to darken the color of a dish. Kicap manis, sweetened soy sauce sometimes flavoured with star anise or garlic, is also a popular seasoning for cooking. The sweet and savoury taste of kicap manis also functions as a substitute to approximate the combination of dark soy sauce and thick caramel sauce, which is primarily used to colour and season stewed dishes. Other essential seasoning and garnishes include tamarind (Malay: asam jawa), specifically the paste-like pulp extracted from the fruit pod which contributes a tart flavour to many dishes. Candlenuts (Malay: buah keras) are similar in appearance to macadamia nuts, being round, cream coloured and have a high oil content. Candlenuts are normally ground to thicken sauces. Lup cheong is a type of dried Chinese sausage made from pork meat and spices. Mainly used by the Malaysian Chinese community, these sweet sausages are usually sliced very thinly and added for additional flavour and texture. Recent studied have shown that there are 62 commonly consumed Malaysian foods that include biogenic amines. A popular dish based on rice in Malaysia is nasi lemak, rice steamed with coconut milk and pandan leaves to give it a rich fragrance. Of Malay origin, nasi lemak is frequently referred to as the national dish. It is customarily served with ikan bilis or fried anchovies, peanuts, sliced cucumber, hard boiled eggs and sambal. Although it is often considered a breakfast dish, because of the versatility of nasi lemak in being able to be served in a variety of ways, it is commonly eaten at any time of the day. For a more substantial meal, nasi lemak may be served with fried chicken, curries, or a spicy meat stew called rendang. Congee is a type of rice porridge or gruel popular among Malaysia's ethnic communities. It is eaten primarily as a breakfast food or late supper. It is also considered particularly suitable for the sick as a mild, easily digestible food. Congee is called bubur in Malay; 粥 written in Chinese, pronounced as zhou in Mandarin Chinese and juk in Cantonese; and kanji (கஞ்சி) in Tamil. It may be served plain with little embellishment, or cooked with ingredients like fish slices, seafood, chicken, beef, pork, vegetables, and even spices. The importance and popularity of congee in the Malaysian diet is such that bubur ayam or chicken congee is a permanent fixture on the menu of Malaysian McDonald's restaurants. Noodles are another popular staple, particularly in Malaysian Chinese cuisine, but used by other groups as well. Noodles such as bi hoon (米粉, Hokkien: bí-hún, Malay: bihun; rice vermicelli), kuay teow (粿條, Hokkien: kóe-tiâu) or ho fun (河粉, Cantonese: ho4 fan2; flat rice noodles), mee (麵 or 面, Hokkien: mī, Malay: mi; yellow noodles), mee suah (麵線 or 面线, Hokkien: mī-sòaⁿ; wheat vermicelli), yee meen (伊麵 or 伊面, Cantonese: ji1 min6; golden wheat noodles), dongfen(冬粉, Hokkien: tang-hún, Cantonese: dung1 fan2; cellophane noodles), Lao Shu Fen (老鼠粉, Cantonese: lou5 syu2 fan2; silver needle noodles), and others provide an alternative source of carbohydrate to a serving of rice that accompanies every meal. Stir-fried noodle dishes (Malay: mee goreng) are ubiquitous throughout Malaysia's cities, towns and villages, with numerous localized variants prepared by various ethnic communities according to their culinary traditions and preferences. Many types of seafood are consumed in Malaysia, including shrimp or prawn, crab, squid, cuttlefish, clams, cockles, snails, sea cucumber and octopus. In general, members of all ethnic communities enjoy seafood, which is considered halal by Malaysian Muslims (according to Shafi’i fiqh), though some species of crabs are not considered Halal as they can live on both land and sea. Sea cucumbers are considered halal. Malaysian Malays, who form about half of Malaysia's population, are Muslim and therefore do not consume pork since Islam forbids it. This does not prohibit others from producing and consuming pork products, and thus pork can be found in wet markets, supermarkets and hypermarkets, usually displayed with a non-halal disclaimer. Pork is consumed by the Chinese Communities, the Iban, the Kadazan, Murut, Lun Bawang / Lundayeh, the Orang Asli, and expatriates. Locally grown vegetable produce is available year-round as Malaysia is a tropical country and does not have four seasons. During rainy seasons, vegetable yields may decrease (which may result in an increase on market price), but rarely if ever stop altogether. Imported produce has made inroads into the market in recent years, either to supplement local demand for essential ingredients like garlic and potatoes, or to supply produce which do not grow well in Malaysia's climate and soil conditions. A few regions in Malaysia, like Cameron Highlands and the foothills adjacent to Mount Kinabalu provide the appropriate mean temperatures and soil conditions for the cultivation of temperate produce like Camellia sinensis or tea. Malaysian-grown greens, tubers and vegetables commonly found nationwide include but not limited to amaranth (bayam), bean sprouts (taugeh), brinjals (terung), bitter gourd (peria), bok choi (sawi), cabbage (kobis), choy sum, cucumber (timun), Chinese celery (daun sup), coriander (daun ketumbar), ginger (halia), green beans, kangkung, "lady's fingers" (bendi), leeks, lettuce, lotus root, maize (jagung), napa cabbage (kobis cina), sweet potatoes (ubi keledek), spring onions (daun bawang), Sauropus androgynus (cekur manis or sayur manis), pumpkin (labu), shiitake mushrooms (cendawan), stink beans (better known as petai), tapioca (ubi kayu), taro or yam (ubi keladi), tomatoes, yambean or turnip, turmeric (kunyit), and yardlong beans (kacang panjang). In some areas in Malaysia local produce is grown on a small scale, and many rural communities like the Peninsular Orang Asli and certain tribal peoples of Sarawak forage wild edible ferns or vegetables to supplement their diet. Diplazium esculentum, better known as pucuk paku pakis, is perhaps the most widely available fern and is found in eateries and restaurants throughout the nation. Stenochlaena palustris is another type of wild fern popularly used for food. Endemic to East Malaysia, it is called midin in Sarawak and is prized for its fiddleheads by locals and visitors. Stenochlaena palustris is known by the native peoples of Sabah as lemiding, lembiding or lombiding, where both the leaves and the fiddleheads of the plant are eaten. The young shoots of plants like bamboo and coconut are popularly harvested as food by communities outside urban areas. A popular way to cook leafy vegetables like kangkung and sweet potato leaves is stir frying with a pungent sauce made from belacan (shrimp paste) and hot chilli peppers. Other vegetables popularly cooked this way include bean pods and fiddlehead ferns like paku pakis and midin. Vegetables like carrots, cucumbers, onions and yardlong beans are used to make a localised variety of pickle called acar. Vegetables and herbs are also popularly served undressed and often raw in some rural indigenous communities as ulam. An ulam spread may include items such as banana blossoms, cucumber, winged beans, pegaga leaves, petai, and yardlong beans, typically eaten with a pungent dipping sauce like sambal belacan. The durian, a fruit with a spiky outer shell and a characteristic odour is a local tropical fruit that is notable because it provokes strong emotions either of loving it or hating it. It is also known as the "King of the Fruits". Several species of durian exist throughout Malaysia - common cultivars come with pale cream or yellow coloured arils, whereas some varieties found in Borneo are naturally bright red, orange or even purple in colour. The papaya, or betik in Malay. Another common fruit available year-round in Malaysia, and widely eaten to conclude a meal. 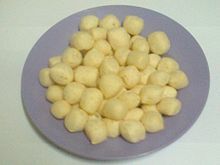 Kuih (plural: kuih-muih) are usually, but not always, bite-sized foods associated with the Malay and Min-speaking Chinese communities of Malaysia. In the context of the term being cultural as opposed to being physically descriptive, the concept of kuih may refer to a selection of cakes, cookies, confections, pastries and sweetmeats. Kuih may be eaten throughout the day for light breakfast, afternoon tea (a tradition adopted from the British), as a snack and increasingly as an after meal course. More often steamed or fried and based on rice or glutinous rice, kuih items are very different in texture, flavour and appearance from Western oven-baked cakes or puff pastries. Most kuih items are sweet, and may be classified and eaten as desserts, but some are also savoury. Kuih is an important feature for festive occasions and is traditionally made at home, but are now available for purchase from home caterers, street hawker vendors, market stallholders and specialist cafes, shops and restaurants. It is difficult to distinguish between kuih of Malay or Peranakan (also known as "Straits Chinese") origin because the histories of traditional kuih recipes have not been well-documented, and cross-cultural influencing over the centuries were commonplace. Even the word kuih itself is derived from the Hokkien/Teochew word 粿 (pronounced kueh or kway). Dadar/Ketayap is a rolled crepe (usually flavored with pandan juice) and filled with grated sweet coconut filling (flavoured with gula melaka (Malaysian palm sugar)). Niangao (Chinese : 年糕) or kuih bakul - a brown sticky and sweet rice cake customarily associated with Chinese New Year festivities. It is also available year-round as a popular street food treat, made with pieces of niangao sandwiched between slices of taro and sweet potato, dipped in batter and deep-fried. Ayam goreng - a generic term for deep fried chicken, typically marinated in a base of turmeric and other seasonings prior to cooking. Ayam masak merah - this dish literally means red-cooked chicken in English. Pieces of chicken are first fried to a golden brown then slowly braised in a spicy tomato sauce. Peas are sometimes added to the dish, and it is garnished with shredded kaffir lime leaves as well as coriander. It is often paired with nasi tomato - rice cooked with tomato sauce or paste, milk, dried spices, and a sauteed rempah base of garlic, onions, ginger. Kebebe- the food which made of 13 ingredients that has a bitter, salty, sweet, sour and spicy mixed taste. Its allegedly able to get rid of nausea after taking too much food. Kerabu - a type of salad-like dish which can be made with any combination of cooked or uncooked fruits and vegetables, as well as the occasional meat or seafood ingredient. There are many kerabu recipes, which often have little common in preparation: kerabu taugeh is made with blanched bean sprouts and quintessentially Malay ingredients like kerisik, while preparations like kerabu mangga (shredded green mango salad) resemble a Thai-style yam salad in taste profile. Keropok lekor - a speciality of the state of Terengganu and other states on the east coast of Peninsula Malaysia, keropok lekor is a savoury fritter made from a combination of batter and shredded fish. Sliced and fried just before serving, it is eaten with hot sauce. Kerutuk Daging - a type of coconut milk-based curry. Traditionally it is best eaten with white rice, sambal belacan and ulam-ulaman or Malay salad. Ketupat - a variant of compressed rice, wrapped in a woven palm frond pouch. As the rice boils, the grains expand to fill the pouch and the rice becomes compressed. This method of cooking gives the ketupat its characteristic form and texture. Usually eaten with rendang (a type of dry beef curry) or served as an accompaniment to satay, ketupat is also traditionally served on festive occasions such as Eid (Hari Raya Aidilfitri) as part of an open house spread. Laksam or Laksang - a different variant on laksa found in the northern and northeastern states of the Peninsular. Laksam consists of thick flat rice noodle rolls in a full-bodied, rich and slightly sweet white gravy of minced fish, coconut milk and shredded aromatic herbs. Nasi tumpang - rice packed in a cone-shaped banana leaf. A pack of nasi tumpang consists of an omelette, meat floss, chicken or shrimp curry and sweet gravy. It is traditionally served as a meal of convenience for travelers on the road. Nasi ulam - rice salad tossed with a variety of thinly shredded herbs and greens (daun kaduk, daun cekur, daun kesum and so on) as well as pounded dried shrimp, kerisik and chopped shallots. A variant popular in the eastern coast states of Peninsular Malaysia is called nasi kerabu, which is blue-coloured rice served with various herbs, dried fish or fried chicken, crackers, pickles and vegetables. Sambal - the term sambal not only refers to a relish-like sauce made from chili peppers pounded together with secondary ingredients like belacan and thinned with calamansi lime juice, it also refer to a cooking style where meat, seafood, and vegetables like brinjal (Malay: sambal terung) and stink bean (Malay: sambal petai) are braised in a spicy sambal-based sauce. Satay- one of Malaysia's most popular foods, Satay (written as sate in Malay) is made from marinated beef and chicken pieces skewered with wooden sticks and cooked on a charcoal grill. It is typically served with compressed rice cut onions, cucumber, and a spiced peanut gravy for dipping. The town of Kajang in Selangor is famous for its satay; Sate Kajang is a term for a style of sate where the meat chunks are bigger than that of a typical satay, and the sweet peanut sauce is served along with a portion of fried chilli paste. Sup kambing - a hearty mutton soup slow simmered with aromatic herbs and spices, and garnished with fried shallots, fresh cilantro and a wedge of calamansi lime. Variants include soups cooked with beef (Malay: daging), beef ribs (Malay: tulang), or oxtail (Malay: buntut/ekor), all seasoned with the same herbs and spices. There are certain Malaysian dishes with overt Javanese influences or are direct adaptations from Javanese cuisine, brought to Malaysia by Javanese immigrants who have been assimilated or integrated into the wider Malay community to various degrees. Javanese cuisine is highly distinct from mainstream Malay cooking, being noted for its simplicity and sweeter flavours, as opposed to mainstream Malay cuisine which is predominantly based on the complex and spicy regional cuisines of Sumatra. A popular way of serving Javanese-influenced food in the southern part of Peninsular Malaysia is termed nasi ambang, which consists of shared platters of white rice served with accompaniments like chicken cooked in soy sauce or curried gravy, stir fried noodles, sambal goreng, fried shredded coconut pieces, egg, vegetables and so on. .
Begedil - spherical fritters made from mashed potato and occasionally ground meat. It is called perkedel in Indonesia. Bean Sprouts Chicken (Chinese : 芽菜雞) - Ipoh's most well known dish, Bean Sprouts Chicken consists of poached or steamed chicken accompanied with a plate of blanched locally grown bean sprouts in a simple dressing of soy sauce and sesame oil. The crunchy and stout texture of Ipoh-grown bean sprouts is attributed to the mineral-rich properties of local water supplies. The dish is usually served with hor fun noodles in a chicken broth, or plain rice. Cantonese fried noodles (Chinese : 廣府炒) refers to a preparation of noodles which are shallow or deep fried to a crisp texture, then served as the base for a thick egg and cornstarch white sauce cooked with sliced lean pork, seafood, and green vegetables like choy sum. A variation called yuen yong (Chinese : 鴛鴦) involves mixing both crisp-fried rice vermicelli as well as hor fun to form a base for the sauce. A related dish called wa tan hor (Chinese : 滑旦河) uses hor fun noodles, but the noodles are not deep fried, merely charred. Char kway teow (Chinese: 炒粿條，炒河粉). Stir fried rice noodles with bean sprouts, prawns, eggs (duck or chicken), chives and thin slices of preserved Chinese sausages. Cockles and lardons were once standard offerings, but mostly relegated to optional additions these days due to changing taste preferences and growing health concerns. Penang-style char kway teow is the most highly regarded variant both in Malaysia as well as abroad. Chee cheong fun (Chinese: 豬腸粉) is square rice sheets made from a viscous mixture of rice flour and water. This liquid is poured onto a specially made flat pan in which it is steamed to produce the square rice sheets. The steamed rice sheets is rolled or folded for ease in serving. It is usually served with tofu stuffed with fish paste. The dish is eaten with accompaniment of semi sweet fermented bean paste sauce, chilli paste or light vegetable curry gravy. Ipoh and Penang have different variants of the dish as well; certain stalls in Ipoh serve the dish with a red sweet sauce, thinly sliced pickled green chillies and fried shallots, whilst in Penang, a type of sweet, black shrimp sauce called hae ko is the main condiment. Cheong Cheng style steamed fish (Chinese: 酱蒸鱼) - Cheong cheng literally mean gravy or sauce steamed. The main ingredients for the gravy or sauce are fermented bean paste and chillies. Chicken rice (Chinese: 雞飯) - chicken rice is one of the most popular Chinese-inspired dishes in Malaysia. Hainanese chicken rice (Chinese : 海南雞飯) is the best known version: it is prepared with the same traditional method used for cooking Wenchang chicken, which involve steeping the entire chicken at sub-boiling temperatures within a master stock until cooked, to ensure the chicken meat becomes moist and tender. The chicken is then chopped up, and served with a bowl or plate of rice cooked in chicken fat and chicken stock, along with another bowl of clear chicken broth and a set of dips and condiments. Sometimes the chicken is dipped in ice to produce a jelly-like skin finishing upon the completion of the poaching process. 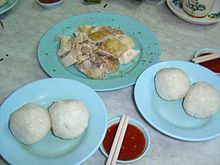 In Malacca, the chicken rice is served shaped into balls. Curry Mee (Chinese: 咖喱面). A bowl of thin yellow noodles mixed with bihun in a spicy curry soup enriched with coconut milk, and topped with tofu puffs, prawns, cuttlefish, chicken, long beans, cockles and mint leaves, with sambal served on the side. It is often referred to as curry laksa. Fish head bihun (Chinese : 鱼头米粉). A noodle soup in which the main ingredients are rice vermicelli and a deep fried fish head cut into chunks. The soup itself is somewhat creamy, which is usually achieved using a mixture of rich fish stock and milk. Tomatoes and pickled vegetables are sometimes added to cut the richness and provide a tangy foil for the noodle soup. Hakka mee (Chinese : 客家麵) - Hakka Mee is a simple dish of noodles topped with a ground meat gravy. A popular hawker dish with Hakka cultural roots, it is based on an older recipe called Dabumian (Chinese : 大埔麵); the name indicates its place of origin as Dabu County (Chinese: 大埔县), the center of Hakka culture in mainland China. Heong Peng (Chinese: 香饼) - these fragrant pastries, which resemble slightly flattened balls, are a famed speciality of Ipoh which are now widely available in Malaysia and are even exported overseas. It contains a sweet sticky filling made from malt and shallots, covered by a flaky baked crust and garnished with sesame seeds on the surface. Hokkien Mee (Chinese: 福建炒麵) actually has two variants, with each being ubiquitous to a particular region of Peninsular Malaysia. Penang Hokkien mee, colloquially referred to in Penang as Hokkien mee, is also known as hae mee (Chinese : 蝦麵) elsewhere in Malaysia. One of Penang's most famous specialties, it is a noodle soup with yellow and rice noodles immersed in an aromatic stock made from prawns and pork (chicken for halal versions), and garnished with a boiled egg, poached prawns, chopped kangkung and a dollop of spicy sambal. Hokkien char mee, a dish of thick yellow noodles braised, fried with thick black soy sauce and added with crispy lardons, is more commonly served in the Klang Valley. It was originally developed in Kuala Lumpur. Thus, within the central region of Peninsular Malaysia, the term Hokkien mee refers to this particular version. Ipoh white coffee (Chinese: 怡保白咖啡). A popular coffee drink which originated in Ipoh. Unlike the robust dark roast used for typical Malaysian-style black coffee ("Kopi-O"), "white" coffee is produced with only palm oil margarine and without any sugar and wheat, resulting in a significantly lighter roast. It is typically enriched with condensed milk prior to serving. 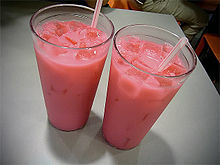 This drink inspired the OldTown White Coffee restaurant chain, and instant beverage versions are widely available throughout Malaysia and even in international markets. Kam Heong (Chinese : 金香) - literally "golden fragrance" in English, Kam Heong is a method of cooking developed in Malaysia, and is a good example of the country's culinary style of mixing cultures. The tempering of aromatics with bird’s eye chilies, curry leaves, crushed dried shrimp, curry powder, oyster sauce and various other seasonings yields a versatile stir-fry sauce that goes well with chicken, clams, crabs, prawns, and squid. Kway chap (Chinese : 粿汁). Teochew dish of rice noodle sheets in a dark soy sauce gravy, served with pork pieces, pig offal, tofu products and boiled eggs. Lor mee (Chinese: 滷麵). A bowl of thick yellow noodles served in a thickened gravy made from eggs, starch and pork stock. Marmite chicken (Chinese : 妈蜜鸡) - a unique dish of marinated fried chicken pieces glazed in a syrupy sauce made from marmite, soy sauce, maltose and honey. This dish may also be prepared with other ingredients like pork ribs and prawns. Claypot chicken rice (Chinese : 瓦煲鸡饭) - chicken rice served in a claypot, traditionally cooked with charcoal. Typical additions include salted fish and lap cheong. Bercham, a suburb in Ipoh is famous for claypot chicken rice. Ngo hiang or lor bak (Chinese: 五香 or 滷肉) - a fried meat roll made from spiced minced pork and chopped water chestnuts rolled up in soya bean curd sheets, and deep fried. It is usually served with small bowl of Lor (a thick broth thickened with corn starch and beaten eggs) and chili sauce. The term also extends to other items sold alongside the meat rolls, like tao kwa (hard tofu), pork sausages, tofu skin sheets etc. Oyster omelette or O-chian (Chinese: 蚝煎) - a medley of small oysters is sauteed on a hot plate before being folded into an egg batter, which then has moistened starch mixed in for thickening, and finally fried to a crisp finish. Unlike other versions of oyster omelettes found throughout the Hokkien and Teochew diaspora, a thick savoury gravy is never poured onto Malaysian-style oyster omelettes; a chilli sauce is provided on the side for dipping instead. Pan mee (Chinese: 板面) - noodle soup with hand-kneaded and torn pieces of noodles or regular strips of machine-pressed noodles, with a toothsome texture not unlike Italian pasta. A variant popular in the Klang Valley is known as "Chilli Pan Mee", and which of cooked noodles served with minced pork, a poached egg, fried anchovies and fried chili flakes which are added to taste. Chilli Pan Mee is accompanied with a bowl of clear soup with leafy vegetables. Tau sar pheah (Chinese: 豆沙饼) - A famous Penang delicacy, this round-shaped Chinese pastry contains primarily green bean paste, and its ingredients include wheat flour, sugar and salt. It is also known as Tambun biscuits as it was widely believed that the pastry originated from Bukit Tambun, Penang. Its popularity as a delicacy has made this pastry one of the must-buy souvenirs from Penang. Yau Zha Gwai or Eu Char Kway or You Tiao (Chinese: 油炸鬼 or 油条) - a version of the traditional Chinese crueller, which is a breakfast favourite. It can be eaten plain with a beverage like coffee and soy milk, spread with butter or kaya, or dipped into congee. It is shaped like a pair of chopsticks, stuck together. Yong tau foo (Chinese : 酿豆腐) - tofu products and vegetables like brinjals, lady's fingers, bitter gourd and chillies stuffed with fish paste or surimi. Originally developed in Ampang, Selangor, Malaysian yong tau foo is a localised adaptation of a Hakka dish called ngiong tew foo (stuffed tofu with ground pork paste) and is usually served in a clear broth, with or without noodles. Yusheng (Chinese : 鱼生) - a festive raw fish salad, also pronounced yee sang in the Cantonese manner. While raw fish preparations are thought to have existed in China during antiquity and can be found in the Chaoshan region of Guangdong province in modern times, yusheng was created and developed in Singapore in 1964 when the republic was still a member state of the Federation of Malaysia. It consists of strips of raw fish tossed at the dining table with shredded vegetables, crispy tidbits and a combination of sauces and condiments. Yusheng literally means "raw fish" but since "fish (鱼)" is commonly conflated with its homophone "abundance (余)", Yúshēng (鱼生) is interpreted as a homophone for Yúshēng (余升) meaning an increase in abundance. Therefore, yusheng is considered a symbol of abundance, prosperity and vigor. As a result, the mixing and tossing of yusheng with chopsticks and the subsequent consumption of the salad has become ritualised as part of the commemoration of Chinese New Year festivities in Malaysia and Singapore. Lei Cha (Chinese: 擂茶) - This aromatic drink is a Hakka staple. The recipe differs from household to household, but generally green tea leaves are added to a mixture of salt, ground mint leaves, toasted sesame seeds and nuts. The mixture is ground or pounded into a fine powder, then brewed into a drink. Taste salty, minty, and full of nutrition. Malaysian Indian cuisine, or the cooking of the ethnic Indian communities in Malaysia consists of adaptations of authentic dishes from India, as well as original creations inspired by the diverse food culture of Malaysia. As the vast majority of Malaysia's Indian community are mostly ethnic Tamils who are descendants of the modern Indian state of Tamil Nadu and Sri Lanka's Northern Province, much of Malaysian Indian cuisine is predominantly South Indian inspired in character and taste. A typical Malaysian Indian dish is likely to be redolent with curry leaves, whole and powdered spice, and contains fresh coconut in various forms. Ghee is still widely used for cooking, although vegetable oils and refined palm oils are now commonplace in home kitchens. Before a meal it is customary to wash hands as cutlery is often not used while eating, with the exception of a serving spoon for each respective dish. Chapati - a North Indian style flatbread. It is made from a dough of atta flour (whole grain durum wheat), water and salt by rolling the dough out into discs of approximately twelve centimetres in diameter and browning the discs on both sides on a very hot, dry tava or frying pan without any oil. Chapatis are usually eaten with curried vegetables. and pieces of the chapati are used to wrap around and pick up each bite of the cooked dish. 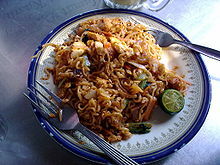 Maggi goreng - a unique Mamak-style variant of mee goreng or stir-fried noodles, using reconstituted Maggi instant noodles instead of yellow egg noodles. The noodles may be wok-tossed with bean sprouts, chilli, greens, eggs, tofu, and meat of choice, although no recipe at any Mamak eatery are ever the same. It is usually accompanied with a calamansi lime. Roti canai - a thin unleavened bread with a flaky crust, fried on a skillet with oil and served with condiments. It is sometimes referred to as roti kosong. A host of variations on this classic dish may be found at all Mamak eateries, either at the creative whim of the cook or by customers' special request. A few examples include: roti telur (fried with eggs), roti bawang (fried with thinly sliced onions), roti bom (a smaller but denser roti, usually round in shape), roti pisang (banana), and so on. Across the sea from Peninsular Malaysia on Borneo island, lie the states of Sabah and Sarawak. Traditional lifestyles and limited roads still predominate outside of the major cities, especially in Sarawak, where rivers are the only major highways for much of the inland population. The jungles of Borneo are teeming with wild plants, fungi, and fruits, and its sweeping coastlines and many large rivers provide an abundance of seafood and freshwater fish fit for the dinner table. A rich variety of traditional food has been developed by Borneo's many tribes and indigenous groups over the centuries; much of it is healthy food, consisting of foraged (now increasingly cultivated due to modernisation) and fermented foods. Because much of the region was once under the Brunei Sultanate's thalassocracy, the Bruneian Malay people have left a lasting culinary influence, particularly on the cookery of the coastal Muslim communities of East Malaysia. According to the source paper written in 2006, the Malaysian food industrial sector accounted for about 14% of the total manufacturing energy consumption. Like Peninsular Malaysia, rice is the undisputed staple food for the majority of the people of Sabah and Sarawak. Rice is central to Kadazandusun culture, and its paramount importance is reflected in the annual Kaamatan festival, as well as traditional beliefs and customs since antiquity which revolve around the veneration of rice spirits. But for other ethnic communities throughout Sabah and Sarawak, cassava or tapioca tubers as well as sago starch are also popular staples. The tapioca tuber is just as important as rice to the Bajau people of Sabah, while the Dayak peoples of Sarawak make extensive use of both the tuber and leaves of the tapioca plant in their cooking. Sago starch is derived from the pith extracted from the sago palm, and is the staple food for the Melanau and the Penan peoples of Sarawak. Sago starch is prepared as a gooey and sticky paste by the Bisaya and Kedayan communities called ambuyat, and is called linut by the Melanau. It is eaten by rolling the paste around the prongs of a bamboo fork, and dipped it into soup, sambal, or other varieties of gravies and dipping sauces. Aside from being the source for sago pith, the sago palm is a source of another delicacy for the indigenous peoples of Borneo: the sago grub. Called butod in Sabah and ulat mulong in Sarawak, sago grubs are typically eaten raw but also served deep fried, roasted or sauteed. Historically speaking, fresh produce is often scarce for hunter-gatherer nomadic tribes around the world, thus it is usually preserved out of necessity for important events and festivals. The tribal peoples of Sabah and Sarawak are no different - most of them have developed age-old techniques for curing, fermenting or preserving their supplies of fresh meat, fruit and vegetables. For example, during festive occasions the Murut people of Sabah would serve tamba (jeruk or jaruk in the Malay language) made from fresh raw wild boar or river fish, which is stuffed in bamboo tubes along with rice and salt and left to ferment for a few weeks, a technique which is also practised by the Lun Bawang people across the border in Sarawak. Fermented products are also frequently used as a cooking ingredient besides eaten on its own. Dayak households in Sarawak may saute their version of fermented meat with garlic and tapioca leaves (either fresh or pickled), and fermented tempoyak is a popular cooking seasoning. The production and consumption of traditional liquor plays an important cultural role for the non-Muslim peoples of East Malaysia. Alcoholic drinks made from rice is the most common form, as well as the widely available. In Sabah, the Penampang Kadazan lihing is perhaps the most well known. Yet due to the historical lack of a standardised Kadazandusun language used and understood statewide, ethnic groups from other districts in Sabah have very different names for similar fermented rice-based drinks: hiing (certain Dusun languages), kinomol, segantang, kinarung, kinopi, linahas, and even tapai To add to the confusion, tapai proper as understood by most Peninsular Malaysians is a fermented sweet and sour rice paste served as a snack or dessert, although further fermentation of the tapai to produce alcoholic drinks is possible. The preferred party drink of the Murut, made from the tuber of the cassava or tapioca plant, is also called tapai. The Iban of Sarawak call their rice wine tuak, which must not be confused with Sabahan talak, which is a hard liquor made from rice. To the native peoples of Sarawak, tuak may also refer to any alcoholic drink made from fermenting any carbohydrate-rich substance besides rice. The food of Sabah reflects the ethnic diversity of its population and is very eclectic. Traditional Kadazandusun cuisine involves mostly boiling or grilling and employs little use of oil. From simple appetizers of seasoned unripe mango to a variety of pickled foods collectively known as noonsom, tangy and pungent flavours derived from souring agents or fermentation techniques is a key characteristic of traditional Kadazandusun cooking. Rice wine accompanies all Kadazandusun celebrations and rites, and at a Murut event there will be rows upon rows of jars with fermented tapioca tapai. Presently few eateries in Sabah serve traditional indigenous dishes, although it will always be found during festive occasions like weddings and funerals, as well as the Kaamatan and Kalimaran cultural festivals. Chinese-influenced dishes like northern Chinese potstickers and Hakka stuffed tofu, along with many original creations developed in Sabah's interior settlements by immigrants from both northern and southern China throughout the 20th century, feature prominently on the menus of many kopitiam establishments and upscale restaurants. Sabah is notable for its excellent seafood, temperate produce and tea (Sabah tea has GI status) grown in the highlands of Mt. Kinabalu, and a small coffee plantation industry with Tenom coffee considered the best produce in the region. Local ingredients like freshwater fish, wild boar (bakas in native dialects), bamboo shoots, wild ferns, and various jungle produce still figure prominently in the daily diet of the local population. As a significant portion of rural communities still subsist on agriculture as their primary source of income, small scale festivals are even held each year at certain towns to celebrate produce vital to the livelihoods of the local people: the Pesta Jagung of Kota Marudu, the Pesta Rumbia (sago) of Kuala Penyu, and Pesta Kelapa from the town of Kudat. Sabah vegetable, also known as cekuk manis or sayur manis (Chinese : 树仔菜), can be found on the menus of many eateries and restaurants throughout the state of Sabah. It is one of the local terms used for a variety of Sauropus albicans developed in Lahad Datu, which yields crunchy edible shoots in addition to its leaves. The flavour is reminiscent of spinach but more complex, "as though it had been fortified with broccoli and infused with asparagus", and is typically stir-fried with eggs or seasonings like sambal belacan. Whether grilled, cured, deep-fried, steamed, stir-fried, braised, served raw, or made into soups, Sabah’s seafood is famed for its freshness, quality, and good value for money. A vast variety of fish, cephalopods, marine crustaceans, shellfish, sea cucumbers and jellyfish have become mainstays on lunch and dinner menus at kopitiam, restaurants, and humble food shacks all over Kota Kinabalu and other coastal towns like Sandakan, Tawau, Lahad Datu and Semporna. Seafood paired with noodles also figure prominently for breakfast, for each day locals flock to speciality eateries where they may be served an assortment of fish-based products to start the day. Examples include: poached patties handmade with fresh fish paste; deep-fried fish cakes wrapped in tofu skin sheets; and noodle soups with toppings like sliced fish fillet, fish balls, prawn balls, and fish innards. A few eateries even serve "noodles" rolled out with fresh fish paste. Beaufort Mee (Chinese: 保佛炒面) is a speciality of Beaufort town. Handmade noodles are smoked, then wok-tossed with meat (usually slices of char siu and marinated pork) or seafood and plenty of choy sum, and finished off with a thick viscous gravy. Bosou, also called noonsom or tonsom, is the Kadazandusun term for a traditional recipe of tangy fermented meat. Smoked and pulverised buah keluak (nuts from the Kepayang tree (Pangium edule) which grows in Malaysia's mangrove swamplands), or pangi is a key ingredient and acts as a preservative. Combined with rice, salt and fresh meat or fish, the mixture is then placed into a sealed jar or container for fermentation. Contemporary variants for bosou add bananas and pineapples to the mixture. Pinongian is a variant where rice is omitted to produce a final product which is much less tangy in taste; however, unlike bosou, "pinongian" must be cooked before serving. Ngiu chap (牛什) is a Chinese-influenced dish of beef or buffalo broth served with noodles, usually immersed in the soup with slices of poached beef or buffalo meat, meatballs, stewed brisket, tendon, liver and various offal parts. An iconic Sabahan dish, ngiu chap has many different variations, from the lighter Hainanese style to heartier Hakka-influenced flavours, and even village-style ngiu chap adapted for indigenous tastes. Piaren Ah Manuk is a chicken curry made from a sauteed rempah base and grated coconut, then braised in coconut milk. This dish is very popular in the Iranun community. Variants include fish (Piaren Ah Sada) and unripe jackfruit (Piaren Ah Badak). Nuba laya/Nuba tinga is an ordinary rice wrapped with banana leaf or nyrik leaf. This dishes is to ease the farmer and the traveller for them to carry for a long journey. Usually this dishes is very famous among the Lun Bawang/Lundayeh people and this dishes a bit similarity to the linongot. However, this Nuba Tinga/Nuba laya is different because the rice is very soft and can bitten easily by senior citizen. Pinjaram (or known as: Penyaram) is a Bajau and Bruneian Malay heritage. It is famous and popular almost everywhere in Sabah and can be found in night markets and Tamu (Sabah weekly market). Sinamu Baka is a Lun Bawang/Lundayeh traditional food. This is a tangy fermented food same like a Bosou but the differences is sinamu baka only suitable for wild bear. Tinonggilan is a slightly sparkling alcoholic drink made from maize. Tinonggilan is a Rungus specialty and is usually served during festive occasions, or as refreshments for guests during the performance of a ritual dance called Mongigol Sumundai. Tompek is a Bajau food made from grated tapioca, eaten as an alternative starchy staple to rice. The grated tapioca is squeezed to dry out mixture and crumbled, then fried or toasted until golden brown. Grated tapioca may also be packed into cylindrical shapes and steamed until it forms into a chewy tubular cake called putu, another traditional Bajau staple. Tuaran mee (Chinese: 斗亚兰面) is a speciality of Tuaran town. This dish of wok fried fresh handmade noodles is well known in the nearby city of Kota Kinabalu as well as in neighbouring Tamparuli town, where the localised adaptation is called Tamparuli mee (Chinese: 担波罗利炒生面). The noodles must first be toasted with oil in the wok to prevent it from clumping together, then blanched to reduce the stiff crunchy texture from toasting. The final step involves stir frying the noodles to a dry finish with eggs, vegetables, and meat or seafood. Tuhau (Etlingera coccinea) is a type of wild ginger, specifically the stems of the same plant popularly served as a relish by the Kadazandusun community. The stems are typically chopped up and served fresh with lime juice, or mixed with local chives and chilli peppers then cured with salt and vinegar. A more recent recipe called serunding tuhau involves slicing tuhau stems into thin floss-like shreds, which is then sauteed until it becomes golden and crisp. It has a distinctive scent which is said to have a polarising effect even among indigenous Sabahans. Sarawakian is quite distinct from the regional cuisines of the Peninsular. It is considered less spicy, lightly prepared and with more emphasis on subtle flavours. The most important spice in Sarawakian cuisine is pepper. Pepper is commercially produced on an industrial scale as a cash crop, and the preferred choice by local cooks when heat is wanted in a dish. Granted GI status by MyIPO, Sarawak black pepper is highly regarded by international culinary figures such as Alain Ducasse. While the Iban constitute the largest Dayak subgroup as well as the most populous ethnic group in Sarawak, much of the ethnic Iban population is still concentrated away from Sarawak's main urban areas, congregating instead within longhouse communities scattered all over the interior regions of the state. The traditional cookery of the Iban is called pansoh or pansuh, which is the preparation and cooking of food in bamboo tubes. Ingredients like poultry, fish, pork, vegetables or rice are mixed with fragrant herbs like lemongrass, tapioca leaves and bungkang leaves (a species of myrtle from the Eugenia genus), then sealed within the bamboo tubes and placed directly over an open fire. Cooking food this way will infuse it with aroma and flavour from the bamboo tubes while keeping it moist. During Dayak festivals or Gawai, the Iban would slaughter locally reared pigs. The pig would be cleaned thoroughly after the slaughter, have its head and stomach removed, and the rest of the pig would be cut into smaller pieces in preparation for barbecuing. The head and stomach of a pig are usually put aside and prepared separately as they are considered the choicest parts of the animal; hence pig's heads are a common edible gift brought by visitors to an Iban longhouse, and dishes such as pork stomach cooked with pineapples are a must for Gawai. Kolo mee or mee kolok (Chinese: 干捞面) is a dish of springy egg noodles tossed in a sweet and savoury shallot, lard and vinegar dressing, and topped with seasoned minced pork and char siu. It is similar to Peninsular-style Hakka mee or wonton mee in concept, but differs significantly in taste profile. A popular variant uses rendered oil from cooking char siu to flavour kolo mee instead of plain lard, which gives the noodles a reddish hue. Halal versions of kolo mee replace the pork components with beef (earning the moniker of mee sapi) or chicken, and lard with peanut or vegetable oil. Additional toppings can include mushrooms, chicken and crab meat. Kampua mee (Chinese: 干盘面) is a similar dish from Sibu of Fuzhou origin. Manok kacangma is a Chinese-influenced dish, traditionally taken by local women for confinement after giving birth. It consists of chicken pieces cooked with ginger and kacangma (Chinese: 益母草), often seasoned with some Chinese wine or tuak by non-Muslim cooks. Three layer tea or Teh C Peng Special is an iced concoction of brewed tea, evaporated milk and gula apong (nirah palm sugar) syrup, carefully presented un-stirred in three or more layers. Originally from Kuching, its popularity has spread to other areas of Sarawak as well as neighbouring Sabah. Peranakan cuisine, also called Nyonya food, was developed by the Straits Chinese whose descendants reside in today's Malaysia and Singapore. The old Malay word nyonya (also spelled nonya), a term of respect and affection for women of prominent social standing (part "madame" and part "auntie"), has come to refer to the cuisine of the Peranakans. It uses mainly Chinese ingredients but blends them with Malay ingredients such as coconut milk, lemon grass, turmeric, tamarind, pandan leaves, chillies and sambal. It can be considered as a blend of Chinese and Malay cooking, with influences from Indonesian Chinese cuisine (for the Nyonya food of Malaccan and Singaporean) and Thai cuisine (for Penang Nyonya cuisine). Traditional Nyonya cooking is often very elaborate, labour-intensive and time consuming, and the Peranakan community often consider the best Nyonya food is to be found in private homes. Acar - various pickled meats and vegetables like acar keat-lah (honey lime/calamansi), achar hu (fried fish), acar kiam hu (salt fish), acar timun (cucumber), acar awat (mixed vegetables). Asam Laksa (Mandarin: 亞三叻沙). Considered one of Penang's three signature dishes, Asam laksa is similar to the Malay laksa utara, which consists of a bowl of translucent al dente rice noodles served in a spicy soup made of fish (usually mackerel), tamarind (both asam jawa and asam gelugor), and daun kesum. Toppings differ considerably, and may include onion, mint, chopped torch ginger flower, and slices of pineapple and cucumber. A dollop of pungent, viscous sweet fermented shrimp paste (Petis udang or Hae Ko) is usually served on the side. Ayam/Babi Pongteh, a stew of chicken or pork cooked with tauchu or salted fermented soy beans, and gula melaka. It is usually saltish-sweet and can be substituted as a soup dish in Peranakan cuisine.Commonly use pork as this is a Peranakan version of Chinese braised pork belly. Enche Kabin, deep fried chicken pieces marinated in a paste of coconut milk and rempah (spices). Kari Kapitan is a Penang Nonya take on the ubiquitous chicken curry. Kaffir lime leaves and coconut milk are among the key ingredients for this mild curry. Kerabu Bee Hoon is a salad dish consisting of rice vermicelli mixed with sambal belacan, calamansi lime juice, and finely chopped herbs and spices. Other famous salad dishes are kerabu bok ni (cloud ear fungus/tikus telinga), kerabu ke (chicken), kerabu ke-kha (chicken feet), kerabu timun (cucumber), kerabu kobis (cabbage), kerabu kacang botol (four angled bean), kerabu bak pue (pork skin). Kiam Chye Boey is a mixture of leftovers from Kiam Chye Ark Th'ng, Jiu Hu Char, Tu Thor Th'ng and various other dishes. "Boey" literally means "end". Pie Tee - A thin and crispy pastry tart shell filled with a spicy, sweet mixture of thinly sliced vegetables and prawns. Caldu Pescator - A seafood soup traditionally prepared by fishermen, as well as during the Feast of St Peter ("Festa San Pedro", in the local Cristang dialect, usually observed on 29 June), the Patron Saint of Fishermen. Chicken pie -, this meat pie, known as empada de galinha or galinha pia, is usually served during Christmas season and other special occasions. Pesce Assa or commonly known as Ikan Bakar or Sambal stingray- Portuguese baked/grilled fish is one of the Kristang community's most famous specialties, now found in major urban areas throughout Malaysia. The fish is smothered with diced lady's fingers and a robust sambal, before it is wrapped in banana leaves as well as a layer of metal foil, and then cooked on a grill. In spite of its name, this dish has little in common with modern Portuguese fish recipes. Soy Limang - a braised dish of fried brinjals, with soy sauce and lime juice as the primary seasonings. Batik cake - a type of chocolate cake similar like the hedgehog slice made using Marie biscuit. Halva or Halwa - the term refers to a range of dense and sweet confections in Malaysia bearing similar names, though they may have little in common in terms of ingredients and texture. Various types of fudge-like flour and nut-based halva cooked with ghee, which are based on traditional recipes brought over from India, are commonly available at specialist sweet shops and regularly prepared by the Indian communities for festive occasions. The Malay community have different recipes for a range of confectionery bearing similar names, which includes candied fruit and Halwa Maskat, a gelatinous jelly made from flour, ghee and pieces of fruit or nut which is similar in texture to Turkish delight. Keria Gula Melaka - is a type of doughnuts that made of sweet potato and slicked with smoky gula Melaka, Malaysian palm sugar. Sarawak layer cake - these famously intricate layer cakes are essential for festive occasions celebrated throughout Sarawak, like Hari Raya, Chinese New Year, Gawai and Christmas. A typical serve of banana leaf rice. As of 2012, about one million people within Malaysia's total population were practising vegetarians, and vegetarian food is much easier to obtain when dining out today. However, because of the heavy emphasis on meat and seafood by traditional Malay cuisine as well as the common inclusion of shrimp paste and other seafood products in many local dishes, diners may find it difficult to negotiate their way around menus in search of vegetarian or vegan food in Malay cuisine restaurants. Restaurants that display signs with the words sayur sayuran, vegetarian or the Chinese characters 素 or 斎 will offer a decent variety of food for diners who abstain from meat. There are many of them across the country, particularly in urban areas. These restaurants serve only vegetarian/vegan food and absolutely no meat or animal products is used in their cooking. Even restaurants that specialise in meat and seafood will make vegetarian dishes upon request. Some meat-serving restaurants have a vegetarian section in their menu. Over 80% of Malaysian Chinese identify themselves as Buddhists, and some follow a vegetarian diet at least some of the time. Some vegetarian Chinese cuisine restaurants offer an exclusively vegetarian menu (Chinese: 素食, 斎) featuring Chinese dishes which resemble meat dishes in look and even taste like "roast pork", fried "fish" with "skin" and "bones", and "chicken drumsticks" complete with a "bone". These restaurants are run by proprietors who abstain from consumption of animal products and strong-tasting vegetables and spices as way of life for religious reasons, and are essentially vegan. The meat analogues used are often locally produced as opposed to imported, and are made solely from ingredients like soy, gluten, mushrooms and tuber vegetables. Organic vegetarians has also slowly become a trendy modern vegetarian dietary nowsady. Most of the organic vegetarian menu will include superfood ingredients for example : organic quinoa, millet, chia seeds, flax seeds, avocado, egg, tofu, pine nuts, bluberry, almond milk and etc. A lot of organic fruit and vegetables are locally produced in recent years. There is even an organic version of vegetarian sambal balacan, Nasi lemak chili paste & etc. Vegetarianism has a long and revered tradition in Indian culture. Some Malaysian Indians are born-and-bred vegetarians who often hail from a family line with generations of vegetarians. Some others practice vegetarianism on auspicious festivals such as Thai Ponggal, Hindu New Year, Deepavali, Full Moon Prayers, and on certain days of the week as a symbol of respect when they visit holy temples. Abstaining from meat before fulfilling a vow is a common practice to bring the body to a neutral and focused state, physically and mentally, during Thaipusam and other holy prayer events. Dishes, of South and North Indian types, are based on the ancient concept of Ayurveda and are known to include arusuvai or six types of tastes. Some Indian vegetarian dishes may incorporate dairy products and honey (lacto vegetarian). Some others are heavily based on lavish coconut milk and nuts. There are many Indian eateries and restaurants in Malaysia that offer a pure vegetarian menu. South Indian restaurants, in particular, offer no shortage of meatless options such as Thali meal, also known as banana leaf rice, which is often vegetarian by default, and a wide array of sweets, snacks and light meals such as kesari, tose, idli, uppuma, vade, aviyal, idiyappam and paniyaram. ^ Kosaku Yoshino. "Malaysian Cuisine: A Case of Neglected Culinary Globalization" (PDF). Sophia University Institute of Comparative Culture, Tokyo. p. 3. Retrieved 2 May 2014. ^ "McDonald's Menu". McDonald's Malaysia. Archived from the original on 7 July 2014. Retrieved 19 July 2014. ^ Su-Lyn Tan (2003). Malaysia & Singapore. Lonely Planet. pp. 17–. ISBN 978-1-74059-370-0. ^ "Penang's iconic 'dragon balls' and other biscuit treats | Eat/Drink | Malay Mail Online". www.themalaymailonline.com. Retrieved 2017-03-18. ^ Ali, M. (2012). Energy and emission analysis in the malaysian food industries (3rd ed., Vol. 32, pp. 777-83). Wiley Online Library. ^ a b c "PETRONASKaamatan Episode 2: Traditional Food". PETRONAS. 27 June 2013. Retrieved 7 June 2015. ^ Konstantim Kakaes (14 August 2014). "Sayur Manis: Delicious, But Also Deadly, Greens From Borneo". National Public Radio. Retrieved 7 June 2015. ^ a b c Nazri Mustapha (10 April 2012). "Uniknya 'Gipsi Laut' Semporna" (in Malay). Utusan Malaysia. Retrieved 29 March 2014. ^ "Amplang". Department of Fisheries, Malaysia. Archived from the original on 16 August 2014. Retrieved 16 August 2013. ^ "Bahar". Kampung Panjut official website. Archived from the original on 28 March 2014. Retrieved 26 March 2014. ^ a b Lydia Koh (2 December 2014). "Sabah noodles (and more) right here in Petaling Jaya". Malay Mail. Retrieved 6 June 2015. ^ "Preserved pork delicacy". Daily Express. 30 October 2013. Archived from the original on 27 March 2014. Retrieved 26 March 2014. ^ a b "Rice in Many Forms". New Sabah Times. Archived from the original on 9 May 2015. Retrieved 26 March 2014. ^ "Nonsoom Bambangan (preserved Bambangan fruit)". New Sabah Times. 10 July 2008. Archived from the original on 2 July 2015. Retrieved 26 March 2014. ^ Patricia Hului (10 June 2014). "Ngiu Chap Sarawak Style". The Borneo Post. Retrieved 6 June 2015. ^ "Piaren Ah Manuk". The Australian. 16 May 2015. Retrieved 6 June 2015. ^ a b Nova Renata Piusai. "Traditional Sabahan Gastronomic Adventure!". New Sabah Times. Archived from the original on 9 May 2015. Retrieved 26 March 2014. ^ Herman Scholtz. "The Rungus The Art of Blending Traditional Life-Style into the 20th Century". The Flying Dusun. Retrieved 7 June 2015. ^ "Alain Ducasse's Nature". Lifestyle Mirror. 29 February 2012. Retrieved 26 March 2014. ^ Bridgette Donald (30 June 2013). "A Unique Dining Experience". New Sarawak Tribune. Retrieved 7 June 2015. ^ Nifea; R. Ahmad; A.A. Putra (2012). "Effect of milk powder, sugar and citric acid on chemical and organoleptic properties of jackfruit-flavoured Malaysian dadih" (PDF). Asian Journal of Food and Agro-Industry. pp. 135–140. ISSN 1906-3040. Retrieved 22 November 2014. ^ "Diwali is sweeter with ladoo". The Star. Asia News Network. 22 October 2013. Archived from the original on 24 October 2013. Retrieved 19 July 2014. ^ Eu Hooi Khaw (13 September 2013). "Mooncakes to love". The Malaysian Insider. Archived from the original on 14 April 2014. Retrieved 19 July 2014. Wikivoyage has a travel guide for Malaysian cuisine.